When creating a design for a piece of cast aluminum furniture, the craftsmen first carve the design from wood. The resulting wooden model is used to make the metal molds for casting the aluminum. The model is pressed into casting sand to make an impression. The impression is filled with molten aluminum. When it is cooled, the sand is brushed away, leaving a detailed cast. Pieces are assembled and welded into place. The entire piece is finished with a powder-coat paint for long life and durability. Unlike iron and steel, aluminum does not rust. That is the biggest selling point for cast aluminum furniture. A nice piece of cast aluminum patio furniture will last thirty or more years. Cast aluminum handles the weather and environment well… it easily withstands rain, snow, salt air and sun. It stands up to cold weather extremely well. Cast aluminum furniture is virtually maintenance free. Just wash it off occasionally with soapy water. It is very solid, and will feel sturdy and strong when in use. It is extremely difficult to bend or break. As for style, cast aluminum can come in just about anything you can think of. 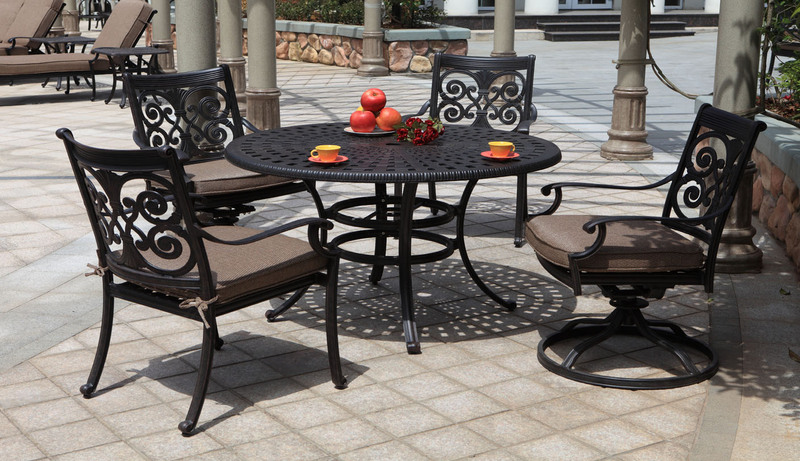 Whether you enjoy traditional or trendy, you should be able to find a cast aluminum furniture set that appeals to you. Cast aluminum works well with or without cushions, and since the furniture is available in a variety of powder-coat colors, it will match whatever design you want. Cast aluminum is much lighter than wrought iron, yet heavy enough to withstand weather and to feel sturdy. Since it is lighter, you will find it easier to move around when needed. 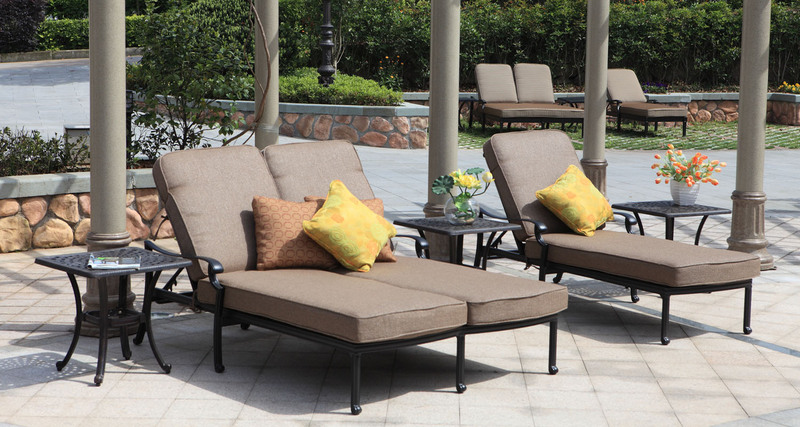 Cast aluminum patio furniture is available in many similar styles to wrought iron furniture. The differences are that cast aluminum comes in many more colors and is lighter weight. It also won’t rust like wrought iron. It lasts a long time, and that may make a difference if you are wavering between cast aluminum and teak. Then it is merely a choice on what will suit your taste better. 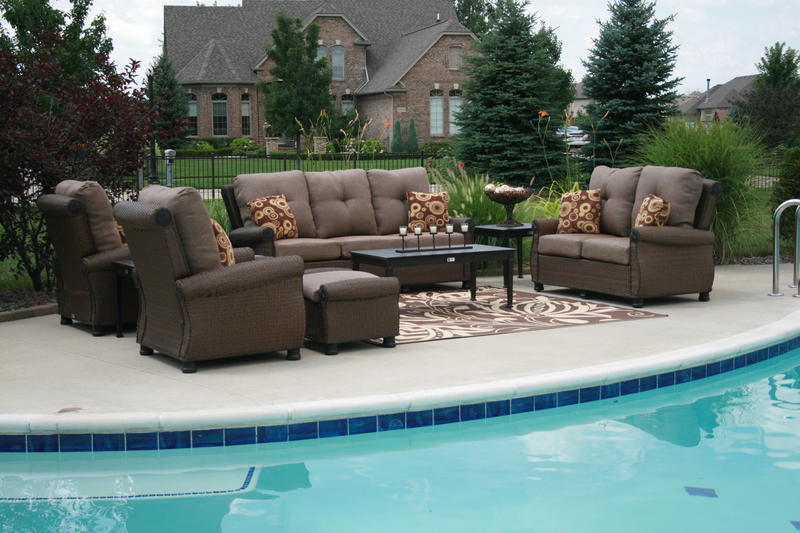 Like any other patio furniture, cast aluminum furniture comes in a variety of qualities. Prices will be lower on large quantity production made items. They may be machine or sand cast, and there won’t be as much attention to detail at the welding points as you will see on a higher end item. Pieces may not be quite as detailed. On the other hand, high end cast aluminum patio furniture will have lots of small details in the design, and each piece will be individually cast and assembled by skilled craftsmen. Higher end pieces will be made of a higher quality aluminum and may be stronger than the lower end items. Like wrought iron furniture, cast aluminum furniture requires the occasional wash down with a mild detergent and water. Rinse the residue off. If you wish, you may apply a spray wax finish to it that is available to use on automobiles. If you notice a scratch, it is important to repair it quickly by sanding the area slightly, then applying a matching paint. Matching paint should be available from the furniture’s manufacturer. While cast aluminum won’t rust like wrought iron, if you allow scratches and chips to accumulate, your furniture won’t look as nice.